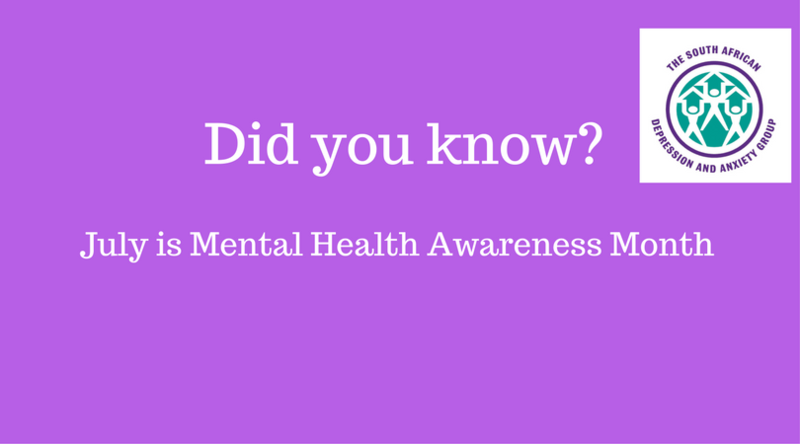 July 2017 is here – that means that SA’s Mental Health Awareness Month is officially underway, and so is the South African Depression and Anxiety Group’s (SADAG’s) DID YOU KNOW? Campaign. Throughout this month, SADAG will be sharing 31 Mental Health Facts (#MHFacts) and partnering with local celebrities to educate South Africans on mental health and fight the stigma surrounding mental illness. Society tends to believe that a person with a mental health condition is ‘crazy’, out of control, or incapable. Too often, people don’t try to get help out of fear of how others will react when they find out. SADAG is advocating for change to show that mental illness is nothing shameful, and getting help is possible. To give you an idea of our month-long campaign, we have attached our first 3 DID YOU KNOW? #MHFacts. Stay up to date by following us on Facebook (The South African Depression and Anxiety Group) and Twitter (@TheSADAG), as well as visiting our website (www.sadag.org), where you’ll find new online videos with experts. You can also help us raise awareness by sharing our posts and promoting them on your media platforms. To help people better understand mental illness and how they can support a loved one, SADAG is running a number of activities during July, alongside the online DID YOU KNOW? Campaign. SADAG Support Groups will be hosting events in various parts of the country throughout the month. On Panic Awareness Day on 10 July, SADAG will be sharing self-help tips to empower patients to manage their condition. This month will also see two free Facebook Friday online Q&As with experts on the topic of Panic Disorder (14 July) and Ask the Doctor (28 July). Everyone is welcome to join these chats and communicate directly with the experts at 1pm and at 7pm on the SADAG Facebook page. In August, SADAG will be hosting a corporate mental health workshop to create awareness in the working environment of how mental illness can impact employees. A local study on Depression in the workplace found that half of those diagnosed with this condition have taken time off work at some point because of it.